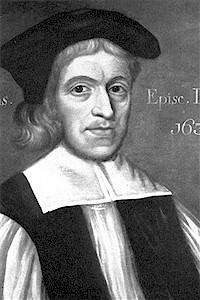 John Cosin was one of Durham’s most famous prince-bishops. He ‘ruled’ for a little over eleven years from December 1660, and was generally held in good regard for his work both within and without the Church – including promoting the interests of schools and charities. Arguably his most famous legacy, however, is the unique style of church woodwork he championed – an elaborate and intricate cross between Gothic and Jacobean. Little of this remains today, however – the font cover in Durham Cathedral being the best example. Further fine examples of Cosin-work were tragically destroyed by fire at Brancepeth in 1998, leaving those remaining at St.Edmund’s Church, Sedgefield, as perhaps the best we have left of this distinctive style of craftsmanship. Surprisingly, there are no good images to be had of St.Edmund’s beautiful interior décor on the Internet*. You’ll just have to go and see it for yourself, I guess. * If you know of any let me know. Modern drainage techniques of the past couple of hundred years or so have transformed our landscape. Gone are the large tracts of uninhabited and largely useless areas of our countryside formerly given over to fenland and marshes. And although the North-East region is hillier than most, we still have many examples of this in our part of the world. If you spend a lot of time studying maps you will be familiar with the term ‘carr’, which means a wooded fen in a waterlogged terrain. Essentially, a low-lying, soggy area, zigzagged by watercourses and peppered with trees such as alder and willow. Soon enough, of course, these areas are drained by man, dry out and are cleared to create farmland. But often the ‘carr’ place-name element remains. And so it is with the four or five square miles of open expanse that lies between Newton Aycliffe and Sedgefield in County Durham. Look at the map today and you will find such name as Bradbury Carrs, Morden Carrs, Carrsides, Ricknall Carrs, Preston Carrs and Swan Carr Farm. The area is noticeably devoid of contour lines, though not short of meandering waterways. Then there are the high points: Great Isle, Little Isle, High Farm and Morden (‘the hill in the fens’). There is Rushyford and Rushyford Beck – self-explanatory, I think. Look at an old map and you’ll see more telling evidence still: the area itself being known as ‘Bradbury & The Isle’, with a clearly labelled feature called ‘The Lough’ (the lake) sitting a little to the south of Morden. And I’ve probably missed some other references, too. Now there’s nothing left of the former, sodden landscape except for two neatly channelled rivers, the odd sizeable puddle after a downpour … and, of course, the place-names. 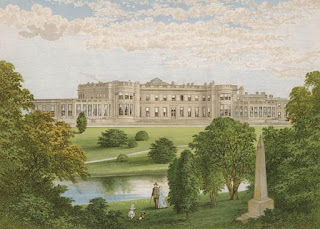 The famous Duke of Wellington was a regular visitor to the 3rd Marquess of Londonderry’s Wynyard Hall. They’d been companions-in-arms during many a military skirmish overseas during their younger days, and after the construction of the latter’s magnificent new pile in the 1820s the duke regular popped in for a cuppa and a chat. 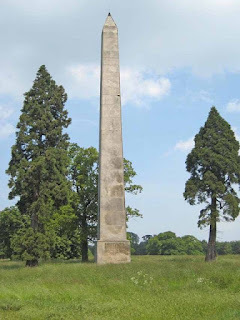 In 1827, the marquess was so overcome by his friendship with the great man during one particular visit that he threw up a 127ft obelisk in his honour in the grounds of Wynyard. Not only that, but the family wing of the mansion itself was nicknamed the Duke’s Wing – and this side of the house also held the Duke's Gallery, where the family kept their art collection. The Wynyard Hall/Park Estate, a few miles north of Stockton-on-Tees, has long been a beauty spot. 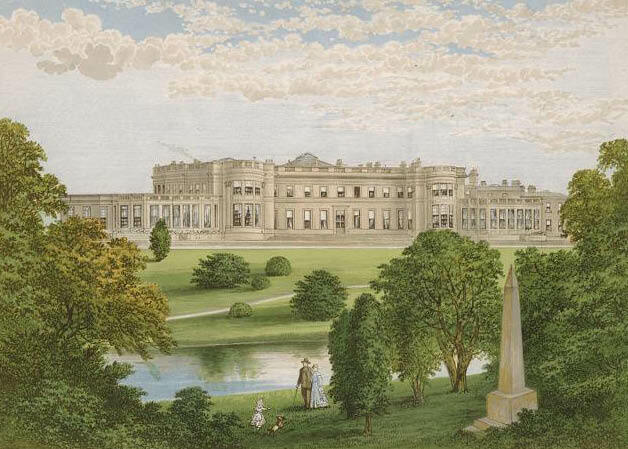 Though the current magnificent mansion dates from a two-pronged building programme spanning 1822-41 and 1842-46 (divided by a catastrophic fire), its history – and reputation – as a site of splendour goes back many centuries. Amongst the distinguished company present was Prince Louis Napoleon, afterwards Emperor of France. On this occasion there was a curious card party, which deserves to be made historical. The gentlemen who took a hand in it were Louis Napoleon, Benjamin Disraeli, George Hudson (the Railway King), and J.J.Wright of Sunderland. Royalty and the social elite have frequented the establishment, including visits in the Victorian era by Edward Prince of Wales and later by Queen Elizabeth II. In celebration of the 2012 Olympics, GenesReunited are currently offering 20.12% off their Platinum subscription (offer runs until midnight on Sunday 12th August). Click below and jump to the 'subscribe' section. Elsdon in Redesdale, Northumberland, has a timeless air with many reminders of a bygone age. For all its turbulent history, it is a delight to the eye: picturesque with a rolling village green and a delightful array of stone houses. Here are to be found the Mote Hills which once housed the Motte and Bailey castle of the Umfravilles, Lords of Redesdale. They came with the Conqueror, William of Normandy, and were granted the lands of Redesdale to hold it against his enemies and wolves. The long-gone castle was built in the year 1080 and served as the headquarters of the Umfravilles until about 1157. Elsdon Pele is a magnificent example of the fortified towers built on each side of the English-Scottish Border as both defence and sanctuary against the Border Reivers. It was built about the year 1400 for the Umfravilles but by 1415 it was in the hands of the Rector. His original home had suffered at the hands of Scottish Raiders. Not long before, in 1399, a Truce between the Scots and English had ended and the North of England was very soon afterwards plundered by the Scots. Elsdon was often a target. There is documentary evidence that the tower was standing in 1415 and that it belonged to the Rector – 'Turris de Ellysden' belongs to 'Rector eiusdem'. It still preserves its character today even after many additions and renovations. The walls are massive and the original vaulted ground floor was once the pen of horses and cattle during Scottish raids or a place of refuge from feuding neighbours. The pele tower is a truly wondrous sight and dominates the village. Although the tower of Elsdon was strong and fortified and offered shelter for the villagers in the endless raids from the Scots, there were many times when the people suffered at the hands of the infamous Border Reivers. An attack of particular note took place in September 1584 when Martin Elliot and five hundred men from Liddesdale attacked the village. Such great numbers indicate that the Scots came in reprisal for earlier raids against themselves. As the Scottish Border Reivers turned for home they left fourteen men dead, had burned down all the houses and made away with four hundred kye (cows), oxen and horses, insight (household goods), and taken four hundred prisoners. From the records that still exist from the time it is clear that the raiding and reiving had reached an intensity that had existed for at least a hundred years before the Liddesdale raid. In 1498, the Bishop of Durham had threatened excommunication on the reivers of Tynedale and Redesdale (which included Elsdon) – not for attacks on the Scots, which was presumably acceptable, but for the family feuds which had reached such an intensity that God-fearing folk lived in daily terror of a raid from their own countrymen. The reiving was literally relentless – and the remedy hard to come by! Today a visit to Elsdon is a great pleasure. It is a peaceful place nestling in rolling hillsides – yet proud of its history and its turbulent past. The church, pele tower, village green and the Mote Hills are all much as they were five hundred years ago – but back then every man looked over his shoulder, wary of the next attack to come screaming out of the hills.